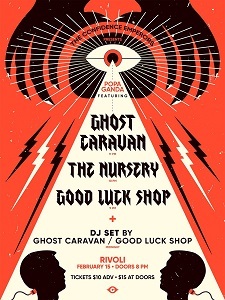 Ghost Caravan will be playing its first show of the year at the Rivoli in Toronto on Friday, February 15th with special guests The Nursery and Good Luck Shop. Doors are at 8:00 PM and tickets are $10 in advance and $15 at the door. Ghost Caravan will be hitting the stage at 11:00 PM and will be performing two new songs.